View of Rangeley Lake and the town of Rangeley from atop the Bald Mountain fire tower. BALD MOUNTAIN TRAIL: Enter the trail .8 miles south of Oquossoc off Route 4, on Bald Mountain Road (opposite Bald Mountain Camps). Distance to summit: 1.75 miles. 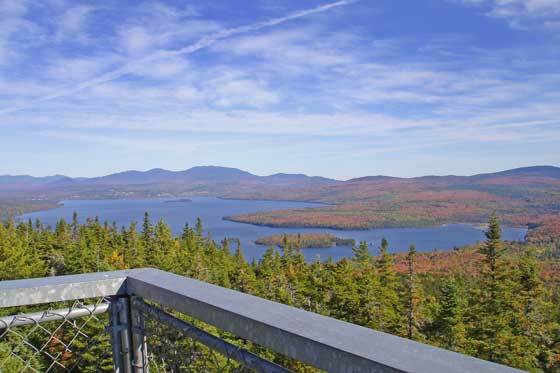 A new 30′ look-out tower at the summit offers a spectacular, 360 degree view of the surrounding mountains and lakes. A great hike for families! Picnic tables are located at both the top and bottom of the trail.